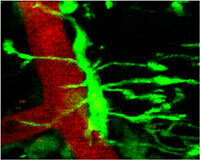 Our lab studies mechanisms of neurovascular regulation of inflammation and tissue repair. Our research focuses on identifying the molecular and cellular interface that blood proteins utilize to interact with nervous system cells and change their functions. Our ultimate goal is to target these interactions for therapeutic intervention in neurologic diseases. Rupture of the vasculature allows the entry of blood proteins into the brain with subsequent edema formation and neuronal damage in a variety of neurologic diseases such as stroke, multiple sclerosis (MS), Alzheimer’s Disease (AD), and spinal cord injury. Our studies aim to unravel the molecular mechanisms of the CNS response to neurovascular changes with the ultimate goal of developing novel therapeutic strategies for neurologic diseases. Our work showed that blood proteins are not merely markers of blood-brain barrier (BBB) disruption, but play a causative role in CNS disease by exerting both pro-inflammatory and neurodegenerative effects. Our studies identified fibrinogen as a potential novel target for therapeutic intervention in neuroinflammatory diseases and led to the design of inhibitory peptides that specifically inhibit the damaging proinflammatory effects of fibrinogen in the CNS without affecting its effects in blood coagulation. Our work also showed that removal of fibrin from the CNS via proteolytic degradation is regulated by the neurotrophin receptor p75NTR via a novel signaling pathway whereby p75NTR directly binds the phosphodieserase isoform PDE4A to compartmentalize cAMP signaling in cells. We also showed novel biological functions for p75NTR as a regulator of cell differentiation that is critical for the progression of fibrosis and tissue repair. Overall, our studies have suggested that bi-directional molecular mechanisms of communication between the blood and the brain determine the degree of damage and the regenerative potential of tissues within and outside of the nervous system. 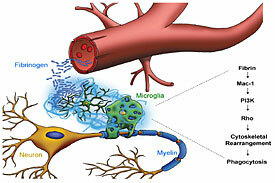 Current support for our research by the National Institutes of Health/National Institute of Neurological Disorders and Stroke (NIH/NINDS) R35 Research Program Award, the National Multiple Sclerosis Society (NMSS), the Conrad N. Hilton Foundation, The Department of Defense (DoD), and Gladstone Institutes. Junior Faculty and trainees are kindly supported by Young Investigator Awards and Postdoctoral Fellowships from: Race to Erase MS, American Heart Association, the National Multiple Sclerosis Society (NMSS), the Thrasher Foundation, the NIH National Institute of Child Health and Human Development (NICHD), National Institutes of Health/National Institute of Neurological Disorders and Stroke (NIH/NINDS). Over the years our research has been possible by grants from the National Institutes of Health/National Institute of Neurological Disorders and Stroke (NIH/NINDS), the National Multiple Sclerosis Society (NMSS), the Dana Foundation, the Department of Defense (DoD), the Christopher and Dana Reeve Foundation, FastForward/NMSS, Lundbeck, The Bechtel Foundation, UCSF Diabetes and Endocrinology Research Center, and the UCSF Liver Center. Trainees in the lab have been supported by NMSS, the German Research Foundation (DFG), the Spanish Research Foundation, the Pediatric Scientist Development Program fellowship (supported by March of Dimes and NIH/NICHD), and NIH training grants.